Months ago I bought a large packet of miso paste to make some Shrimp miso soup and Fried miso udon noodle. Since then the leftover miso paste still sitting in the fridge. 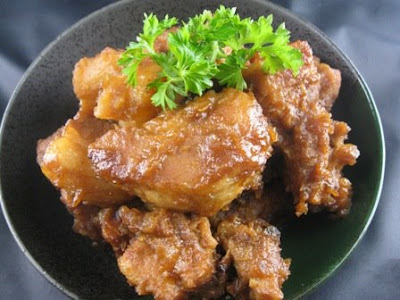 I figure if I use the miso paste to braise with pork belly and potatoes,it would be a great dish for dinner.Miso is a part of many Japanese-style meals.Miso is typically salty, but its flavor and aroma depend on various factors in the ingredients and fermentation process. Different varieties of miso have been described as salty, sweet, earthy, fruity, and savory, and there is an extremely wide variety of miso available. 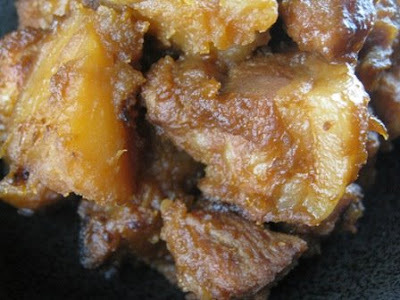 1:Prepare wok or stock pot with oil at medium high heat, add in chopped garlic,fry until fragrant,then add in pork belly. 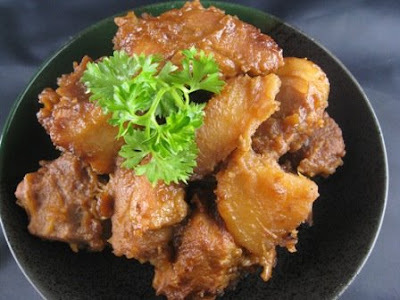 2:Add in water,miso paste,potatoes and soy sauce, cover the pot with lid.Simmer for 30 minutes or until pork belly are soft and potatoes are tenderly cooked. Stir from time to time if you're not using non-stick pot. 3:Add in mirin and stir the combine ingredients,check the seasoning.Add some water if needed. Braise for another 10-15 minutes before remove from heat. 4: Serve warm with rice or noodle. 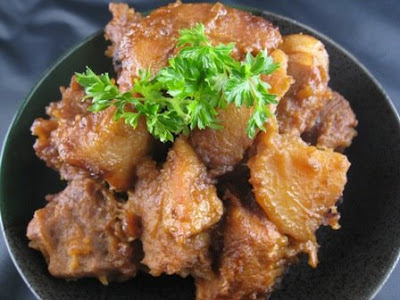 If you're using Idaho potatoes,add into the pork combination after the pork is about 90% cooked ,coz this kind of potatoes is so tender and will disengrated when cooking together for long time.